Whenever we wish to seek any information over the web the first search engine that strikes our mind is Google. Google has made it possible to get the answer to any of our questions! Undoubtedly, Google has a strong hold on search market but it doesn’t mean that other search engines are ineffective. 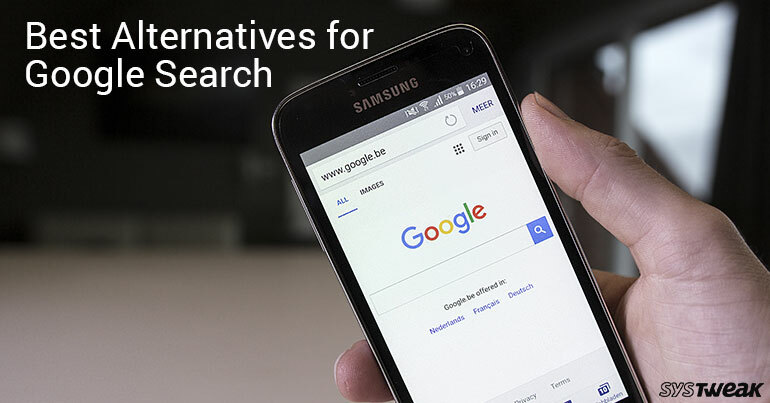 Let’s look at some of the alternatives to Google Search in 2018. Backed by the tech giant Microsoft, Bing is a direct competitor of Google. Bing which started its journey as Windows Live Search is now the second most popular search engine that is used by the users worldwide. When it comes to video search or image search, Bing has an upper hand over Google, as it provides better search results. This is since Google omits the explicit content in its search results. Apart from this, Bing also runs a reward program. Whenever any user uses Bing as a search engine some points as rewards are added to his account. The user can accumulate these points and can later redeem them at various outlets. Yahoo Search the search engine powered by Yahoo made its appearance in the market of Web search earlier than Google. When it comes to ranking, Yahoo holds the 3rd position after Google and Bing. Earlier, until 2004 Yahoo Search was itself powered by Google. However, on July 2009 Yahoo got into a partnership with Microsoft and now Yahoo Search is itself powered by Bing. Now, when it comes to the question that can Yahoo be a better alternative for Google? Then please note that Yahoo also has diversified range of services. Yahoo Finance, Yahoo Answers, Flickr, Yahoo local search are some of the services that are offered by Yahoo itself, also when it comes to privacy then Yahoo offers more privacy and security as compared to Google. Ask.com which was formerly known as Ask Jeeves, is a search engine that primarily focuses on question-answering. The tagline of Ask.com, i.e. “What’s Your Question” also depicts the same. When it comes to popularity though, Ask.com is not as others in the category, like Google, Bing and Yahoo, yet, its simple question-answer format design makes it a choice for many. Ask.com though primarily focuses on question-answer feedback, however it can still be used as a search engine by just simply typing the keywords which are not in the form of questions. DuckDuckGo a search engine that gets its name from one of the famous children’s game duck duck goose is gaining lot of popularity in past few years. The idea of DuckDuckGo can be estimated by the fact that it is now an optional search engine for browsers like Mozilla and Safari and the default search engine for Tor browser. If you are the one who is quite concerned about privacy, then DuckDuckGo is the search engine which you can rely on. The search engine emphasizes mainly on user’s privacy by not tracking or storing any of his search history. Since this search engine doesn’t store user data therefore, no ad targeting. Another search engine that follows the success mantra of DuckDuckGo is IxQuick. This means similar to DuckDuckGo, IxQuick also emphasizes on user’s privacy. Once a default search engine for Tor browser IxQuick claims itself as the world’s most private search engine. As per IxQuick they are the only search engine that does not even record the IP address of the user that uses IxQuick as a search engine. Also, since IxQuick is a meta search engine that uses another search engine data for providing its own results. So, if you are looking for a search engine that provides more comprehensive search results and that too at without compromising your privacy that IxQuick should be your ultimate choice. Yandex, a search engine that is extremely popular in Russia has its English version for its non-Russian users. Apart from Russia the main target base of Yandex is Poland, Ukraine, Kazakhstan, Belarus, and Turkey. Yandex search engine provides its users various services like images, video, mail, translate and maps. Also, if you are the one which is presently residing in Russia then you should consider Yandex as an alternative to Google search as it is the default search engine of Mozilla Firefox in Russia.